Media FHE HEi News Universities could face "Perfect financial storm"
You are here: Home > HEi Know > HEi News > Universities could face "Perfect financial storm"
Universities could face "Perfect financial storm"
Universities could be plunged into a 17 per cent deficit within two years if a “perfect storm” of four adverse factors hit at the same time, the Higher Education Funding Council for England has warned. Such a scenario could wipe £5.4 billion off the sector’s own income forecasts, placing many institutions in a precarious financial position. While this is the “worst case picture”, it could conceivably happen, HEFCE chief executive Madeleine Atkins told delegates at the Council’s annual meeting in London. Although currently no institution is at risk of insolvency, “there are worrying trends”, she added. Senior university leaders and board members were presented with a slide showing how the vast majority of institutions could be deeply in the red by 2017-18 if four adverse factors combined. Institutions would be able to deal with each of the four individually. “But if they occur in combination then the worst case picture puts institutions well below the zero line and that is bad news,” Professor Atkins said. Universities are currently predicting surpluses of 3.3 per cent by 2017-18. But if the four negative trends combined, HEFCE modelling puts the average deficit at 17 per cent, which in monetary terms would be £5.4 billion less income than universities themselves are forecasting. 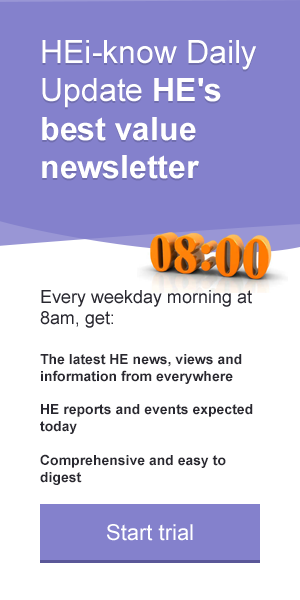 The warning follows a HEFCE report on the financial health of the sector published earlier this week (see HEi-know Briefing Report 270) which said falling surpluses and cash levels and a projected rise in borrowing projected by English universities all point to a financially unsustainable future. While universities appear to be on a stable footing in the short term, there are wide variations in the financial position of individual institutions and greater volatility in funding is expected with growing reliance on income from overseas students. Mary Curnock Cook, chief executive of Universities and Colleges Admissions Service, questioned HEFCE's modelling of a five per cent reduction in home and EU students, saying it did not match UCAS’s most pessimistic forecast. Professor Atkins said it was a worst case scenario but each one could conceivably happen. “We know the government wishes to balance the national books by 2021, and BIS is the largest unprotected department in Whitehall; we know the size of the 18-year-old cohort will decline through this period, and part-time numbers have gone down by 50 per cent and show no sign of recovery. We could see a reduction in overseas income if England is seen as not such an attractive place to come and study,” she said. One government policy that might have that effect is its Prevent strategy and the new duties it places on universities to stop students being drawn into violent extremism. Yvonne Hawkins, HEFCE’s director of universities and colleges, said institutions would not be able to avoid acting on Prevent. “You need to demonstrate that you are thoughtful and have appropriate policies and procedures in place and you have to demonstrate that you are acting on them and not seeing them as something that can be put in a drawer and ‘job done’,” she said. HEFCE will be publishing a draft monitoring framework and approach which is proportionate, risk-based and low burden, she said. It was up to each institution to decide what was appropriate for their situation: it would not be a one-size-fits-all, she added. Sir Nicholas Montagu, Chairman of the Council of Queen Mary University of London, said the government’s policies were “verging on xenophobia”. “We have the Home Secretary making an apparently random suggestion recently that the English language test should be tightened up, and the Prime Minister out of the blue naming and shaming four universities for allegedly allowing extremism, plus the continuing refusal to remove students from the migration total. I have a lot more worries about that!” he said. The potential for more government interference, bureaucracy and inappropriate metrics are all high among the list of worries higher education leaders have about the HE green paper proposals, an HEi-know vox pop of delegates at the HEFCE annual conference found. Here is how some responded to the question "What are the biggest challenges presented by the HE green paper?" “As an “alternative” provider I applaud the green paper proposals. We need them if we are going to have a strong, innovative higher education sector and the sooner the changes are introduced the better. There most certainly needs to be a separation between the regulator and the funder. The funder doesn’t necessarily have to be BIS, it could be an independent body.